Prince George, B.C. – In just a few hours from now, WorkSafe BC will be holding a conference call on the investigation into the two fatal sawmill explosions. It is expected WorkSafe will be releasing details of their investigation into the cause of the blasts and fires which claimed two lives in Burns Lake, and two in Prince George. Prince George, B.C.- WorkSafeBC has just announced it is forwarding its findings of the investigation of the two fatal sawmill explosions and fires to Crown for possible action. WorkSafe BC says it is not recommending any criminal charges, rather, they are asking Crown to review the cases to see if there should be charges under the Workers Compensation Act. It will be up to the Crown to decide if charges under the Workers Compensation Act would be laid. It has been stressed these are not criminal charges. Despite being put on the backburner, the proposed Canfor Trades Training Centre at the former Rustad sawmill site is still a possibility. Originally Canfor and BID Group joined forces with industry hoping to have such a facility up and running by January. Obviously with that date far from realistic, Nechako-Lakes BC Liberal John Rustad says the coming provincial budget could determine the fate of the proposal. An agreement between Richmond County and a paper mill in Port Hawkesbury to reduce the operation’s municipal taxes is being written into law by the Nova Scotia government. Municipal Relations Minister John MacDonell says amendments to the Stora Enso Taxation Act would see taxes paid by the mill remain at $2.6 million for 2012-13, with former owner NewPage and Port Hawkesbury Paper Group Ltd. each paying $1.3 million. New statistics show the number of forestry jobs across Australia has fallen by 16,000 since 2007. The Australian Bureau of Agricultural and Resource Economics and Sciences (ABARES) has released its latest figure into the nation’s forest and wood products. David Cunningham from ABARES says despite many jobs going in the industry over the past five years, there was a slight increase between 2011 and 2012. If domestic and export demand for North American hardwood lumber both increase over the next six months, as expected, the hardwood industry may find it difficult to produce enough lumber because far fewer sawmills are operating than in the past. And the industry has limited access to credit. Resulting price increases could be significant, which would be welcome news for sawmills that have been struggling with thin profit margins. Our team evaluated various structural systems during the initial stages of pre-construction and reviewed potential systems for their embodied energy. 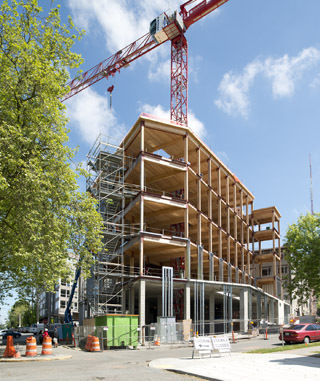 We elected to utilize heavy timber for the structure of the building — a structure well suited for use as a commercial office, but one that can often be designed as concrete, steel or a combination of the two. Gregory and Jonathan Hess have a tall ambition: to grow trees better than anybody else. By “better,” they mean faster, thicker, stronger, taller, higher-yielding and more likely to survive than average trees, even in hostile soils. …Tree Global custom grows trees to the needs of specific industries, from mining companies who need to reforest lands to governments dealing with desertification and farmers who want to improve yields. The company bills itself as the first ever international tree nursery service. B.C. could lead Canada in economic growth by harnessing its natural resources and expanding its export capacity, Premier Christy Clark told industry leaders at a fundraising dinner Wednesday. …She said her government has also opened up China’s market to B.C.’s wood products, noting trade was up nearly 20 per cent from last year. A stand of massive old-growth red cedars in the Upper Walbran Valley has escaped the axe, and the province is now looking for ways to protect unusually big trees. Environmental groups were preparing for another round of the war-in-the-woods after logging tape was found this summer near Castle Grove and the “Castle Giant.” The western red cedar has a five-metre diameter and is listed in the B.C. big tree registry as one of the widest in Canada. But Teal Jones Group of Surrey, which holds the cutting licence, will not be logging that area, a Forests Ministry spokesman said in an emailed response to questions Thursday.
. …But now, bending to pressure from Idaho’s Republican senators, snowmobile enthusiasts and other groups concerned that the planned conservation zone was too large, the U.S. Fish and Wildlife Service has finally approved a critical habitat of just 30,000 acres – less than one-tenth of the original plan – in the U.S. stomping grounds of the cross-border caribou. One of the three remaining fugitives in a string of U.S. fires set by environmental radicals surrendered to authorities Thursday after spending years hiding in Canada. The U.S. attorney’s office in Portland, Oregon, said Rebecca Jeanette Rubin, 39, turned herself in to the FBI at the Peace Arch crossing on the border between B.C. and Washington state. …She was sought on charges that she took part in setting fires at a Vail ski resort in Colorado, at a timber company office in Oregon and at federal wild horse corrals in Oregon and California. Can two men save thousands of acres of Kitsap Peninsula forest? Port Gamble and its surrounding forests have been logging territory for more than a century. Owner Pope Resources is willing to strike a deal with local tribes that would conserve thousands of acres of forestland. If the two sides can agree on terms. It sounds like a classic historical encounter between a colonial leader and a tribal chieftain. But this is not the 19th century: It’s April 2012, and the man pleading for the land is Jon Rose, president of the property group of Pope Resources, a successor to the timber barons who built an empire here. By the early 1900s, the company controlled much of the forest around the bay and built a corporate fortune, displacing Native Americans from their fishing and hunting grounds. The former hub of the company’s operations is a shuttered mill, built on the site of an ancestral Port Gamble S’Klallam village. The Bitterroot National Forest is seeking to fill six positions on the Ravalli County Resource Advisory Committee. The committee consists of 18 members who represent a wide array of interests. The purpose of the committee is to propose projects that will benefit the national forest lands and ecosystems in Ravalli County, improve collaborative relationships, and provide advice and recommendations to the Forest Service. UNIVERSITY PARK, Pa. — With the current focus on carbon emissions affecting climate change and the critical role forests play in storing the element, a better understanding of the impact that fire has on the global carbon cycle is needed by policymakers, according to a researcher in Penn State’s College of Agricultural Sciences….That matters because forest fires release carbon into the atmosphere. are managed with prescribed fire is greater. Some environmentalists have justified their support for the forest peace deal — passed by Tasmania’s Legislative Assembly on November 23 — on the grounds of not letting “perfect” become the “enemy of good”. But a closer look at the details of the deal, which will allow the logging of native forests for another generation, makes clear it cannot even be called “good”. As a signatory to the deal, the Wilderness Society told supporters: “The agreement was reached via genuine negotiation. By definition, that means we didn’t get everything we wanted — nor did the timber industry or the unions. Business standards company, BSI and WWF-UK Global Forest & Trade Network (GFTN) have launched a new good practice guidance to support industry efforts in the responsible sourcing of forest goods and sustainable forest management. The new guidance, known as PAS 2021 – Exercising due diligence in establishing the legal origin of timber and timber products – Guide to Regulation (EU) No 995/2010 – has been sponsored by GFTN and developed to help the timber industry meet the impending EU timber regulation (EUTR) which comes into effect on 3 March 2013. …In the eight years since 2004 – when then Economic Development Minister Lara Giddings declared there were “clear benefits to Tasmania in developing a pulp mill” – a risky gamble has unravelled. Forest policy was once dominated by the expectation that a very large pulp mill would underwrite plantation forestry, and support large scale clearfelling of public forests by providing an outlet for low-grade timber.